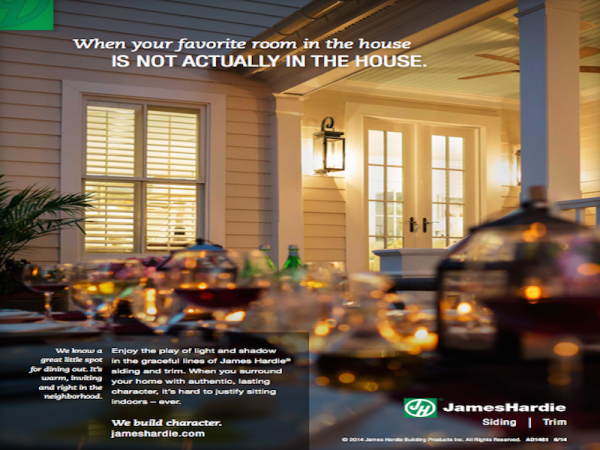 This post and images have been brought to you by James Hardie. All opinions are 100% my own and may differ from yours. I will only endorse companies, products and services that I believe, based on my own experiences, are worthy of endorsement. Our homes reflect our personalities. The exteriors of our homes are an extension of the inside, a reflection of our tastes. My mom always said that 99.999999% of everyone that saw your home, will only sees the outside, especially if you live on a street or road where traffic drives by your home, so the exterior of your home should always look its best. Although you shouldn’t judge a book by its cover, the exterior of your home is the first thing people see, and as my Mom said, probably the only thing they ever will see, so you need to make a great impression. Curb appeal is important. One great way of giving a great impression is through siding and the color of your siding is a great way to show your personality. 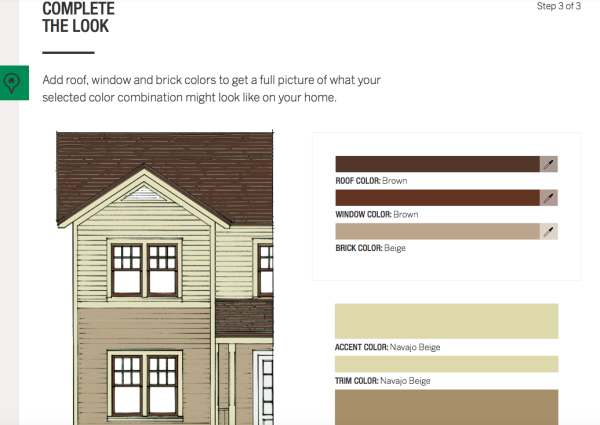 James Hardie has a “Home Color Tool” that helps you decide/discover what is the best color choice in exterior home siding for you. You get color advice so that you can make the best choice for you and your home. It’s as easy as 1, 2 3, to use the color tool…. As you can see, I love the brown and neutral tones, but you can choose from so many different colors. Since there may be slight color differences with what you see on a computer screen and what it would look like in person, you can request examples. Go from blah and boring to the envy of the neighborhood with James Hardie siding. 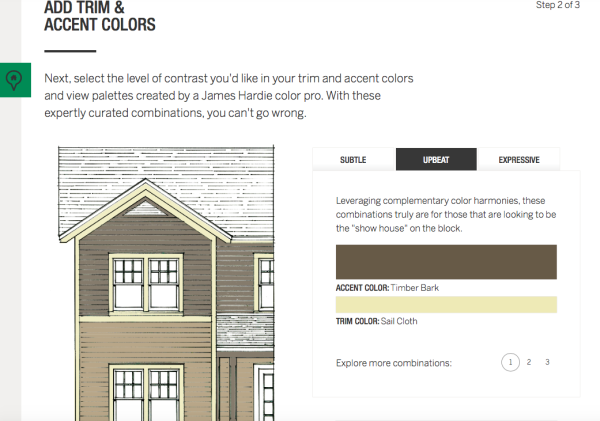 You can be assured that your siding will have a rich and beautiful color with James Hardie’s ColorPlus® Technology. A finish that comes with a 15-year limited warranty that covers paint and labor, protecting against peeling, cracking, and chipping. 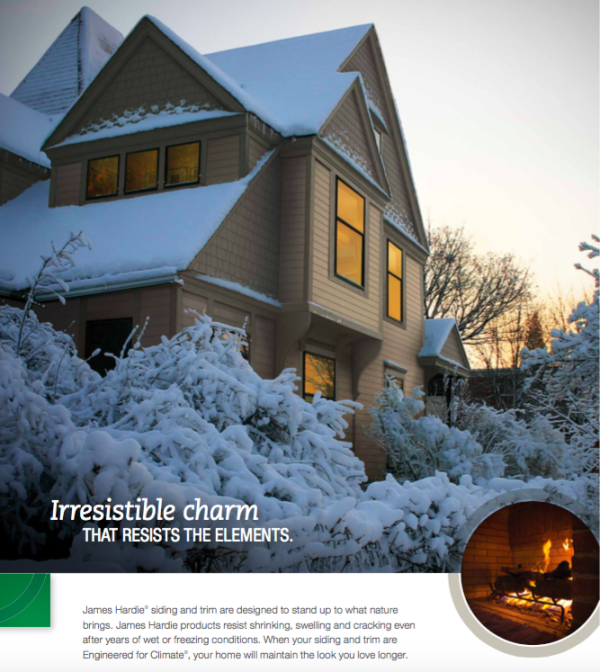 Learn more about James Hardie Inc. and why James Hardie siding is an excellent choice in home siding. If you have vinyl siding or wood siding on the exterior of your home, what color do you have now and what color would you like to change it to? My husband is a painter and I have seen how color can change the way a house looks and feels. My husband and I are thing of repainting the wood sidings. 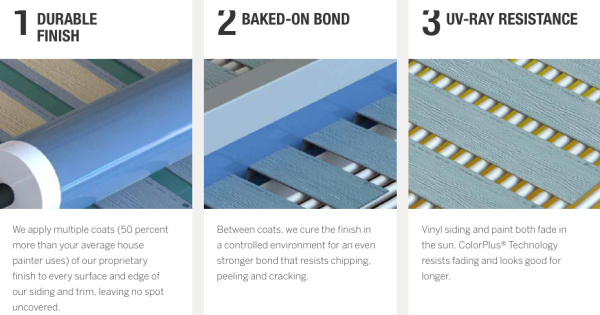 We will definitely consider using the James Hardie’s ColorPlus® Technology. My house could definitely use a few updates. I think it’s time for something new! I feel the same way! It’s always fun to update! My mother should have been an interior, and exterior, designer! As soon as she buys a house, she fixes the inside to look like a masterpiece…and does wonders with the gardens in the front and back of the property! That looks like great siding. I’ll have to give this a closer look. We’ve been thinking about replacing our siding. Great article – like having HGTV for the web! 🙂 We just sold our house and definitely can verify this is valuable information! I love the way siding looks on houses. They don’t really build much like that in AZ. I’d love to redo the siding on our home. It’s such a great way to give your house a facelift and add value. This looks like great siding. I like the idea of using two colors. I would go with a lighter brown on top and a darker brown on the bottom. That looks like such gorgeous siding! I’m into the rustic look and love many of these shades. We rent and I hate the color of our house. It is this odd green color. I would prefer it be a light tan or gray. This is about the coolest thing I have ever seen! I would love to choose the color of our siding for our house. our old house definitely needed an update. It didn’t look nice at all. I love all the ideas on how to update a house. This is really cool. We don’t own we currently rent but when we do own, this would be a great way to upgrade! We just bought a house and it was interesting how the color of the house greatly impacted whether or not we liked it! I’m really liking the blue/gray colors these days! This looks awesome! I wish I owned a home and could do some projects like this, would have a blast with it. I think my home could definitely use a more modern look. I’d at least like the side with the patio to look nice. WE are getting ready to reside our home. 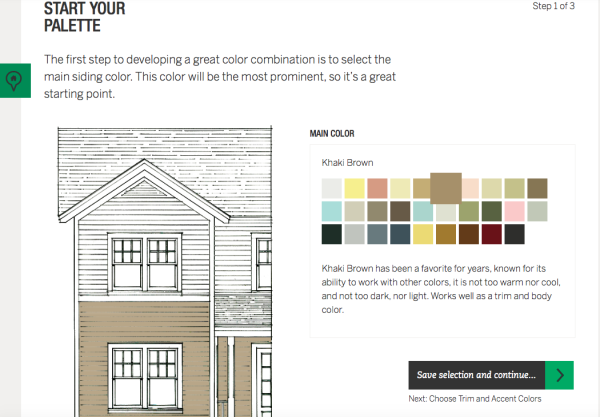 I love the home color tool that allows you to view the siding and trim together before you commit! I love how you can see how it looks with the main color choice and the accents right on the screen. I love your color choices too! That ooks nice. May look at that this next year. That siding looks great! I love the shades that are available! Our house was flipped before we bought it. I love most of the choices, including the siding. It is almost exactly what I would have picked. I would love to be able to update the exterior of my house. The yellow is a fantastic color. There are so many great options to choose from. Changing your siding changes the look of the whole house. It is a great way to give a face lift to a home. I love all the great colors you can choose form. When we moved in one of the first things we did was repaint the kids rooms and the exterior! Makes a huge difference! I really like how you can select from subtle or more expressive siding combinations. I know a feature like the UV ray resistance would definitely come in handy in our area of the country too. We put steel on three sides of our house a few years ago… next we need to decide on the font of the house and will really be looking at James hardie as an option for that. It’s amazing how changing the exterior can make such an impact on your home. Sometimes just freshening things up can make it like a whole new house. I would love to experiment with that tool. Wouldn’t it be nice to have calming blue walls?! I like that Home Color Tool! We are getting ready to repaint our entire house! I love that tool. We are constantly in the midst of a home improvement project, so it would come in handy when it’s time to paint. I have neutrals on my house now as I am a neutral girl. But if I lived at the beach I would have something really happy like yellow. We don’t have many painted homes in Vegas, or well I guess they do paint the stucco… Hmmm. I will have to pay more attention. I would love that home color tool! So very cool for us new home buyers! I really need to get new siding. I have no clue what color I would/ will pick though. I wish I could afford to change the apartment’s interior soon. What great ideas you have here!